A major question that many hiring managers, human resource professionals, and business owners have is how to recruit employees effectively. This is a multi-faceted question that requires a deep dive into best practices and best strategies. For the purpose of this blog we will take a surface level view of many of the key aspects to give you a competitive advantage on recruiting employees. What we will cover here will be applicable to anybody looking to hire any type of position for any type of company. That means you could be a business owner, a human resources professional, a team leader, or anybody else looking to hire for your team. We recommend that this question of how to recruit employees effectively is a question that you constantly ask. This is an area that you can always get better at and always have your team building a next level of efficiency. The better you are at effectively recruiting employees the better you will be at attracting and hiring the top talent in the market. The more top talent you have on your team, the better your company is going to perform. The company is nothing more than its people. 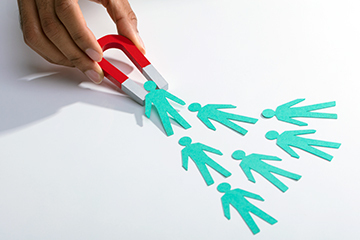 First and foremost, if you’re going to be an effective recruiter for your company you must have a solid and proactive outbound recruiting strategy. Your recruiting strategy cannot rely solely on job boards or passive submissions on your website or LinkedIn, etc. Job boards like LinkedIn, Monster, CareerBuilder, etc. will get your job out there and will bring in candidates. However, the quality of candidates with these types of submissions tend to be low and you will also spend a lot of time sifting through resumes. Generally, the best talent on the market is not actively looking for a new position. The best talent on the market is likely doing an awesome job in a position somewhere with one of your competitors. It’s going to be up to you to recruit them away and onto your team. Therefore you must have a proactive outbound recruiting strategy and a recruiter or recruiters that are dedicated to this. You can have an internal recruiting team that resides in house in your company or you can work with outside vendors like us. Either way, it’s critical you have the strategy in place. You need to have recruiters who know how to tap into the passive talent market to find you the best talent out there. Along with a strong outbound proactive recruiting strategy you also need to have a strong employer brand. An employer brand is what your company represents to your employees and prospect of employees. You want a well-built career page on your website that explains your culture, what you do, who you are, what you value and what’s important to you. We recommend also showcasing your benefits on your website and any other perks that may be involved with working with your company. A strong employer brand goes along way in making your company seem attractive to prospective employees. The more questions you can answer about your culture, benefits, perks, values, etc., the easier it will be to talk with prospective employees. A strong employer brand is critical in representing yourself to the perspective employee marketplace. The second key point is that you want to leverage your employees. Your employers are one of your biggest assets when it comes to recruiting effectively for your company. Your current employees should have a solid understanding of your employer branding. A good experience of your company is a critical aspect of your employer brand. Your employer brand should go beyond just a nice website. Your brand needs to seep into your company culture so that all of your employees are billboards for your company. You want all of your employees to be fully bought into the vision of your company. When this is the case, you can then leverage them as advocates of your company. They likely know a lot of people in the market who would be perfect to join your company and they have large networks and many connections. You want to be able to tap into those networks and tap into those connections. Employees are able to sell your company and the opportunity of your company a lot better than a recruiter. Having a strong employer brand will also help with employee retention – another key point that you want to keep your eye on. Another thing to keep an eye on is your actual interview process itself. You need to have a streamlined and effective interview process that leaves candidates with an excellent experience of your company and who you are. Whether they get the job or not, you want everybody to have a good experience of your company. In a fast-moving market like we’re seeing here in 2018 you also need to have an interview process that is efficient and moves quickly. Many hot candidates are being courted by multiple companies at one time. You want to make sure you move candidates through your process quickly so you don’t lose them to another offer. Some clients might say that if a candidate doesn’t want to wait through the process then they’re not the right person. This is a bad strategy that we do not recommend. You want to move quickly and efficiently no matter what as it’s good for your company and for candidates. Another important aspect to keep in mind is that for any particular position you want to have a very clear picture of what you’re looking for. If you have a job description that is not clearly defined, you’re going to have a hard time truly evaluating if somebody is the right fit for the role. You could end up mistakenly hiring someone that isn’t the right fit because you didn’t interview them against an appropriate measuring stick. The more clarity you have the more you will be able to customize your interview process and weed out the right people. Along these same lines you want to find a way to test the skills of people you’re interviewing. It’s not enough to just ask someone if they can do a particular job because most of the time they will just say yes. You need to find a way to test the candidates in your interview process. This could be a sample presentation, a case study, some sort of technical test, or something of this nature. You want to find a way to test candidates in a real life scenario so that you get an actual picture of them doing the potential job. This is easier said than done for many types of roles, but will go along way after you develop it in your process. Lastly you want to constantly be doing homework about what is the best way to present and negotiate an offer to potential employees. One of the biggest mistakes clients make is to have their first initial offer to a candidate be a lowball offer. They may think that’s a good idea because it gives them room negotiate. While you should not come to the table with your best offer, that also does not mean lowballing a candidate. Lowballing a candidate at the start will often turn them off very quickly. This is an easy way to kill the deal after you’ve spent a long time putting someone through the interview process. Again, don’t make an offer that is your best offer right off the bat. You want to leave some wiggle room for negotiation as everybody wants to feel like they can get a better deal for them self. Be sure to that your offers come with detailed information about your benefits and perks. It’s a good idea to put a monetary value on the benefits and perks so that you can calculate that into your total compensation package. For example, if you’ll be contributing for health insurance, life insurance, paid days off etc. that could add up to another $15-20,000. So essentially the person would be making $120,000 total compensation rather than just the $100,000 base. The more you’re able to spell out someone’s total compensation, the better picture you’re able to paint about what they’re actually signing up for. Candidates tend to be very bad at looking at the big picture and just focus on the base salary number. There are a lot of steps you can take to becoming a more effective recruiter for your company. The steps to recruiting employees effectively are not linear and it’s really a practice that has many facets to pay attention to. If you pay attention to all these facets, you can turn your organization into a highly effective machine that will go after the best talent in the market.